Happenings on the Hill on a Gorgeous Sunday June Morning! Some of the happenings...mucking out the sheep barn, beautifying the cows (including pedicures from the hoof trimmer at 6am), stacking wood for the winter, pizza picnic at the outdoor oven, blooming flowers, lawn mowing, and more! As we write this, there are still piles of snow on the ground in some areas, and mud in others - March in Vermont! Spring is beginning to show itself in various ways at Cobb Hill. We welcomed the equinox and the coming light and warmth, the change of seasons, with a small ritual: the lighting of an orange candle in a special spot. It is east facing, partially enclosed and protected, near the bottom of an oversized sledding hill and pasture rock wall border, which divides the property from south to north. The energy of spring is sensed to arrive from the east with the rising increase in sunlight; the lighted candle represents willing reception to this renewal, a rising to the occasion. In this way, we celebrate the new season and the spirit of the land we humbly reside on. The sap started to flow out of the sugarbush well before the first day of spring. By the time the last tap was set, the sap was flowing, producing 700 gallons that night (February 15th)! 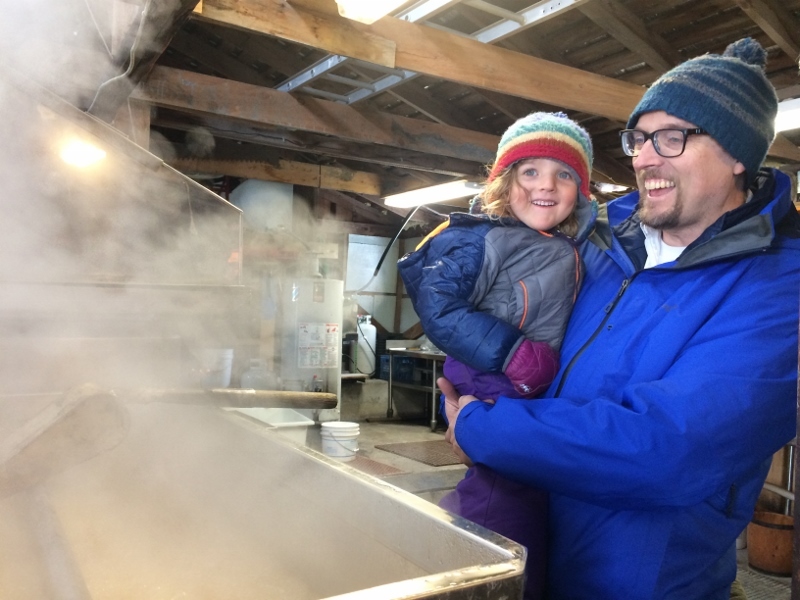 Despite the inevitable weather and equipment challenges of the six week season (leaks, broken pump, freezing and thawing, snow storms), we're on track to reach 500 gallons of delicious maple syrup this year. A week ago, local pre-schoolers visited the sugar house, learning about the process, and even trudging up the hill to see the maple trees. It's a sweet time of year here and across Vermont. Spring also means new life! Eager gardeners have begun sowing seeds in greenhouses and basements up and down the hill and many calves and lambs have recently been born in the barn. Fourteen lambs were born to eight ewes in just over a week (lots of time in the barn for the humans!) 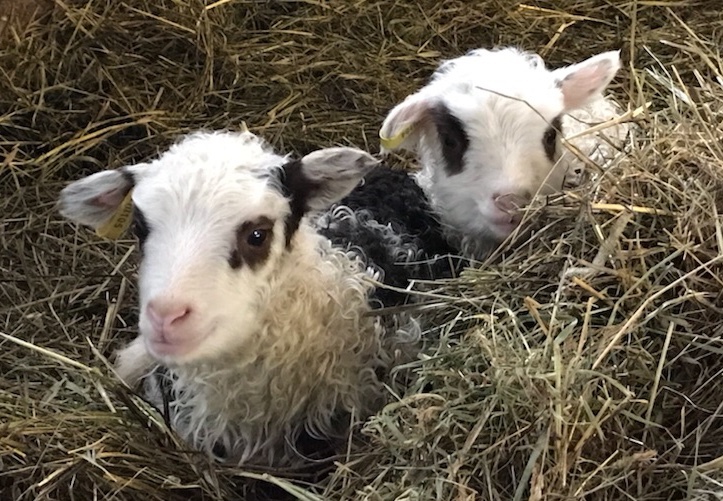 and are all doing well - see adorable video! Whipped Cream, the lone Holstein in the herd of Jerseys, gave birth to her first heifer. See her and other Cobb Hill baby animals in a recent edition of the Vermont Standard. In 2016, Jesse finished building a beautiful and practical earthen, outdoor oven for the community. Now that Jesse's retired, the oven is getting more use than ever. 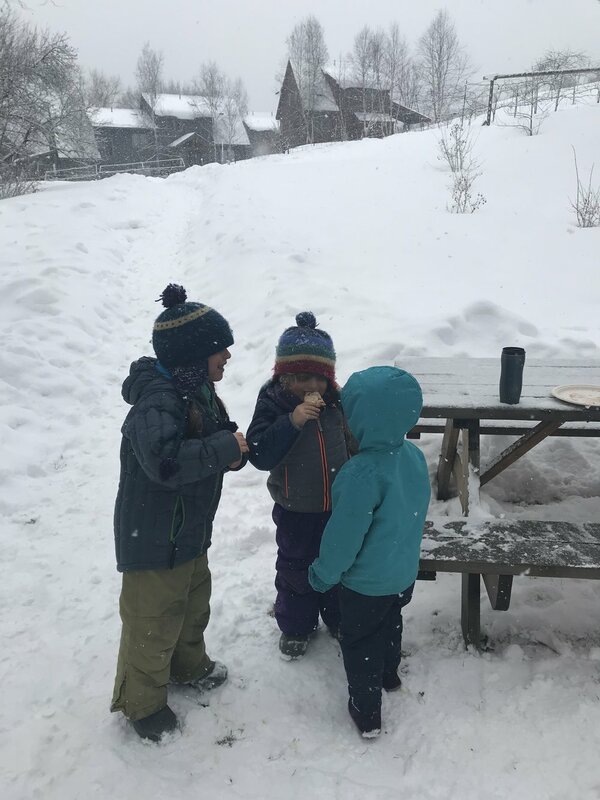 This winter, Jesse has hosted Wiener Parties on every snow day where eager parents and children gather to roast hotdogs, pizza and other lunchtime nibbles. 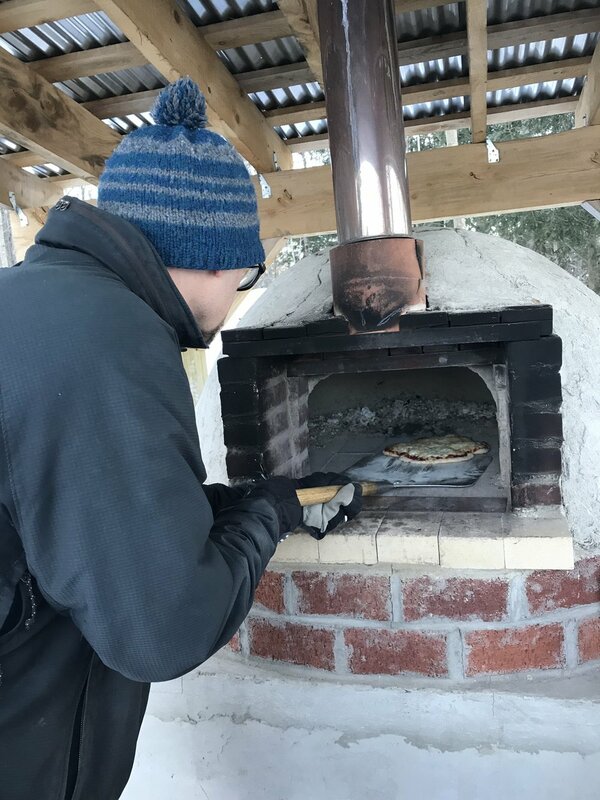 In the last few months, Jesse has also started regular community oven firing days on Saturdays. Households converge throughout the day to bake pizza dough, loaves of bread, baked beans, naan, pita bread and stews of all of kinds. The oven has added another way for us to connect and celebrate together as well as allow the impromptu joy of getting together. 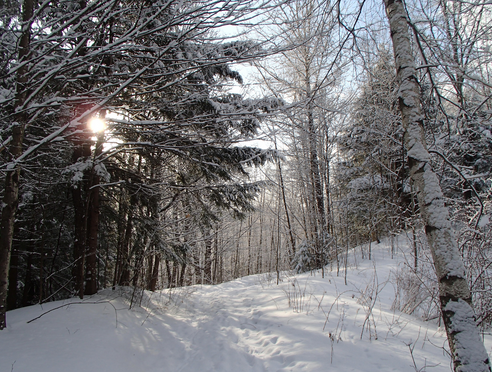 Some might think that not much goes on in the woods during the cold and quiet winter months, here in Vermont, but to the contrary. I just got back from a walk with my trusted dog Gillie, after having seen some new, neatly piled mushroom logs that my husband Bill and the other Shiitake Stooges cut in preparation for the Spring Inoculation Party. Ten minutes prior, I noticed small deer tracks on the Snowshoe trail I had cut weeks ago above the Sheep Pasture and use most days. 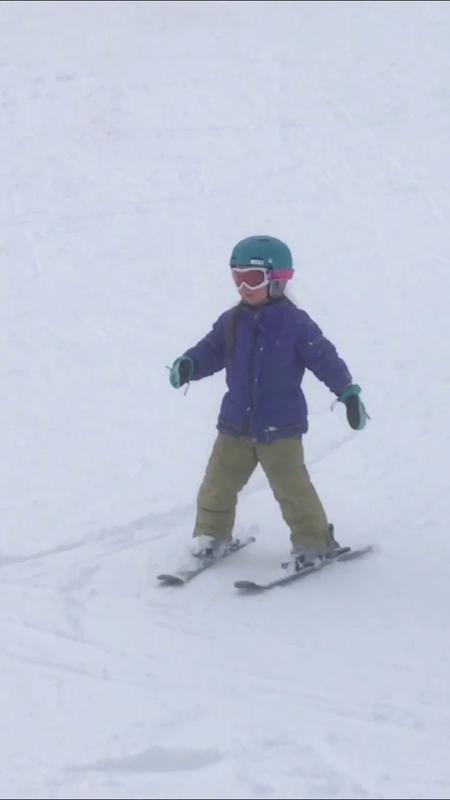 Makes me smile to think that I have made winter walking a bit easier for the young four-leggeds. Earlier in the week, I caught a glimpse of and heard, one of my old forest friends, the grand Pileated Woodpecker. Days before that, I was treated to a Barred Owl conversation, between two who were hooting from a distance. More than a month ago, while cruising along in my Snowshoes, I spooked up what I believe was a Grouse. I also regularly see remnants from a squirrel/chipmunk meal, scattered across the snow. I like the independence of snowshoeing. Really, I can roam anywhere in our woods to create a trail, making it a bit easier the next time I venture out. Sometimes I walk with friends or run into others while I wander, but many days it’s just Gillie and me. She’s great company and spending more time in our woods, I have come to feel very comfortable and at home out there. The 4H kids had a great time. It was a long fair 5 days and they worked hard and had many wonderful moments. We had many first place winners including fall calf, spring calf, 2 year old cow, fall yearling, spring yearling, best 2 sisters, best 3 sisters, vegetables and jam. in 2nd place we had dam daughter, spring yearling Holstein, summer yearling, fall.yearling and 2yr old cow. Maeve got first place in showmanship in her age group and 3rd out of 91 kids.overall. Kate had best in show for her blueberry jam. In a few cow classes the cows took all the 5 top spots. Valerie, our stylish fall calf was reserve jr. Champion. 2017 Cobb Hill Open House A Big Success! There were tours, yummy tastings of farm-made cheese and conversation. We had a great turn-out of visitors from all over the east coast. The 4-H club had presentations and an information table, there were farm tours, a house tour, and general site tours including the wood-fired oven and the shiitake mushroom area. We even had a lemonade stand. Thank you to all who visited. If you missed it, we will have another next year, or contact us to set up a visit. After the event, Cobb Hill members enjoyed yummy pizza from the brick pizza oven. Tours of the shiitake mushroom growing yard, see our new bread oven, central wood-burning heating system, and Cobb Hill Cheese operation. NRCS Vermont picked our farm as their favorite conservation practices in action. USDA then choose us as their national favorite. The focus is on mothers of all types in farming, human,bovine and equine. Cheese lovers rejoice! Cheese Madness is coming to Wild Oats February 24-April 8. This exciting culinary event will pit eight local cheeses against each other to see who will win over customers’ palates to become the 2017 champion! On Fridays and Saturdays during the competition, customers can sample two cheeses and vote for their favorite. The winning cheese will be announced the following Monday, will be on sale that week and will go on to compete in the semi-finals. In addition, each week you vote, you’ll be eligible for the weekly giveaway of a fruit and cheese basket that will include the winning cheese. Quilt for Duncan. Every family made a square. Coleen guided us through and pulled it all together. The kids love it!